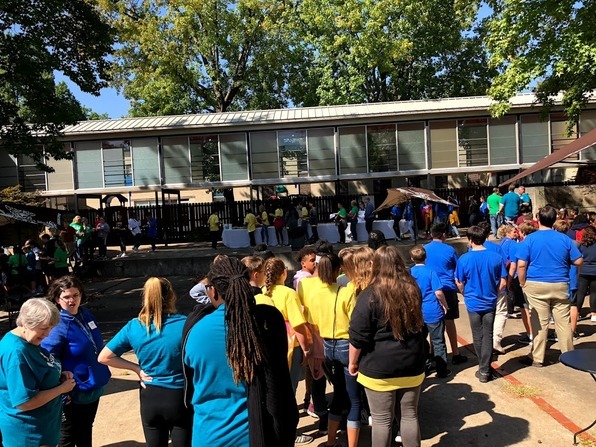 More than 250 students and 50 chaperones from our north county deanery Catholic elementary schools and PSR programs spent the day at Trinity Catholic High School on September 28th for the 12th Annual Confirmation Rally. Led by The REAP Team's Paul Masek and Rachel Leininger, the teens had a full day of activities, talks, small group discussions, Eucharistic Adoration, and Mass. Small groups were assigned so that each group had students from several different schools, giving participants a chance to get out of their comfort zone, meet their counterparts from around the north county deanery and experience how they are part of the larger Body of Christ as they prepare for the sacrament of Confirmation. Click here for a photo album from the day. That you can meet Christ in anyone. I learned that people around me have some of the same problems. I learned that being confirmed is a big step in our life with God and it helps me grow my faith with him. That He died for us and that everything has a meaning. One thing I learned is that you can always go to Jesus when you need to he is there for you no matter what you do. I learned how to make the most of my confirmation and not to treat it like a graduation. To always worship God and to not treat Confirmation like it's nothing. I learned to not treat Confirmation like its the end of your relationship with God. Jesus knows we are human and knows that we will make mistakes and he will always forgive us. I learned that “come Holy Spirit” is just as much of a prayer as any long prayer. I learned about the other girls in our little groups. I liked that. How we shared what we liked about the presentation. I learned not to neglect the Holy Spirit. That Jesus is always with us and that he comes in different forms like a homeless guy or your neighbor. Part of the funding for this retreat day was provided by a grant from the Koch Foundation, a Catholic foundation whose mission to strengthen and propagate the Roman Catholic faith by providing grant support for a wide variety of evangelization efforts. The grant will also fund retreats for our 2nd grade students at Pallottine Renewal Center on Oct. 24, 25 and 29. Each day 3-4 schools will send their 2nd grade students for a day of reflection as they prepare for the Sacraments of Reconciliation and Eucharist. One of the most valued benefits of the Federation of Catholic Schools collaboration is the teacher's participation in Professional Learning Teams (PLTs). On five Friday afternoons per year, teachers from all the elementary schools gather at one of the school campuses and meet in their PLT groups, which are grade-level groups for preschool through fifth grade and subject-area groups for upper-grade Math, Science, Social Studies, Language Arts, etc. Physical Education, Technology, Art and Music also each have a PLT. For the first PLT gathering of the 2018-19 school year, the principals invited counselors from Saint Louis Counseling's School Partnership Program to present a workshop to all teachers on "Becoming Trauma-Informed: The Impact of Trauma on Children." The presentation included information on how trauma affects brain development and gave practical tips and strategies to help teachers deal with issues as they may arise in their classrooms. 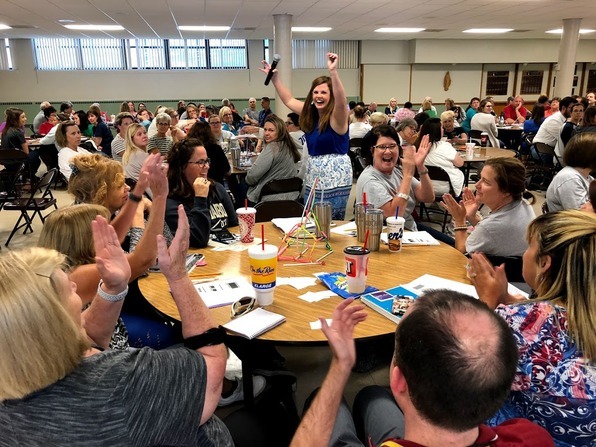 In addition to these types of professional development opportunities, our schools also have increased access to professional counseling thanks to the Beyond Sunday Grant received by the Archdiocese of St. Louis' Department of Special Education. The grant expanded to all Federation schools a program that started last year, which provides a school counselor on-site part-time at each school and a speech-language pathologist who works mostly to evaluate preschool, kindergarten, and primary grade students for early intervention. North County Parishes & Schools are FILLED with Opportunities for Fellowship this Fall! Our north county parishes are filled with opportunities for prayer, worship, faith formation and recreational activities. A few highlights are listed below, with links to each parish bulletin for more details. Try something new, visit a neighboring parish and meet some new friends! Oct. 14 - Oktoberfest - Mass on the Grass, Rides, Games, Fried Chicken Dinner, All are Welcome! It's never to early to share the benefits of Catholic Schools with your friends and neighbors! If you know of a family who may be interested in enrolling their child in one of our excellent schools, be sure to invite them to Explore Catholic Schools!